Thanks to all who came out for our Good Friday act of public witness this year, to all who prepared stations, the planning team, and our hosts at Holy Trinity. See the photos from this year’s walk here. Posted in 2017, Gallery format on January 10, 2017 by swprogram. Each year Rev. Brian McIntosh writes a new verse to the hymn based on the Passion Chorale. This year the 3rd verse was added for the theme of water. of war and wealth and madness, ‘til justice, life is ours. we see in blood-stained faces the crossed-up Christ again. of race and class and creed, denies new life to any |who are betrayed by greed. as hands are washed of doubt. by failing their protection we’ll thirst in desert beds. for reconciliation is why the rabbi died. our songs and prayers revealing the promised end of tears. This was the reflection given by Jennifer Henry at the final station of this year’s Ecumenical Good Friday Walk. Water is the blood that flows through this wounded body, this aching earth. The rivers that connect us, parts of the body, are the veins that carry the life blood to creatures, to peoples. Water is life, interconnected, flowing, nurturing all created beings. Water is sacred bond. Dispersed light in water droplets is the rainbow, the Creator’s inter-species, inter-generational covenant with us. But water is also our vulnerability, our inequities, our risk, our danger. There are women, you know, who can see what we are doing the Body. Women who are binding up the bleeding wounds. Women who are tending to the aching world–with fierce love. Women who are caretakers of the water running through the earth’s veins: Great Lakes water walker, Indigenous Elder, Josephine Mandamin; Cochabamba Bolivian water activist, Marcela Olivera, and Berta–Berta Cáceres who lost her life in her commitment to protect precious waters, waters in Honduras vulnerable from corporate damming. There are women tending to the waters, protecting the waters, caring for the wounds in the Body. Can you hear it? The rushing waters that flow down as justice, the ever flowing fountain of living waters. 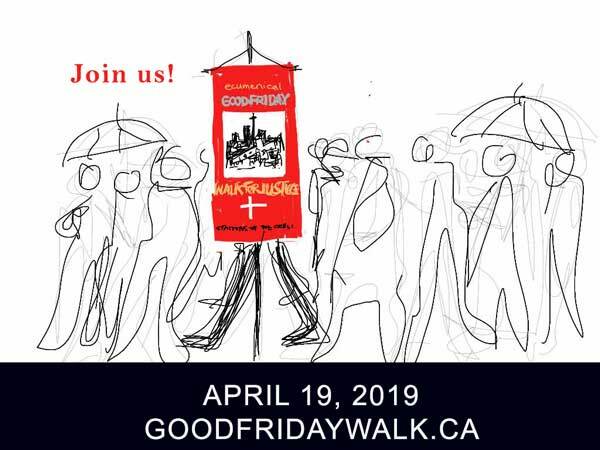 Jesus’ cry from the cross, “I am thirsty,” is the impetus for this year’s Ecumenical Good Friday Walk for Justice in downtown Toronto. On the traditional territory of the Mississaugas of the New Credit First Nation, we will walk in the Lake Ontario Waterfront watershed, starting on the shore of Lake Ontario at Harbour Square Park, just west of the ferry docks at the foot of Bay Street. Participants will gather at 2 p.m., then proceed north on Bay Street, stopping at ‘stations’ along the way to decry the unjust use of the divine gift of water leading to environmental degradation and vast numbers of refugees. 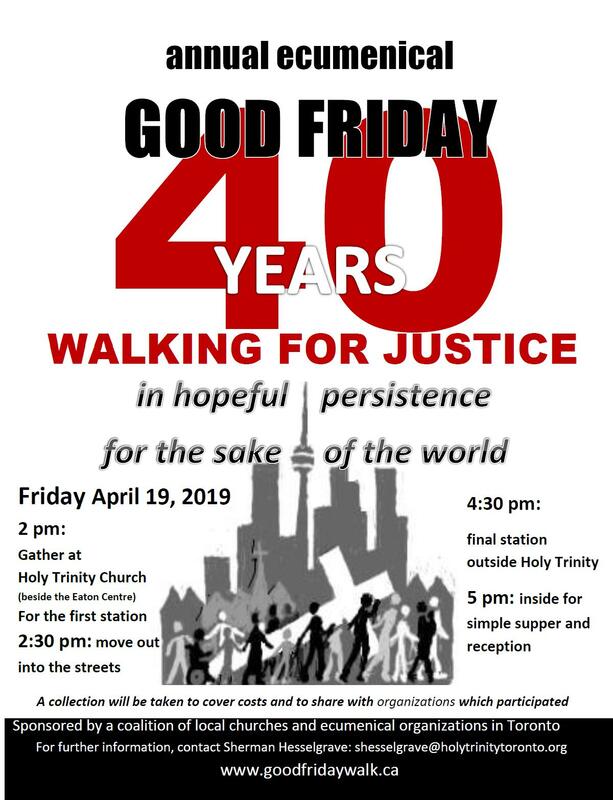 The Walk will end at the Church of the Holy Trinity (just west of the Eaton Centre) for a brief worship service and message from Jennifer Henry, Executive Director of Kairos. “The health of water is about the health of our communities — not only the quality of our relations with the earth community within watersheds, but also the nature of relationships with Indigenous peoples as the original custodians of water,” Henry says. A simple supper will take place there at approximately 4:00 p.m. A freewill offering will support the efforts of participating social justice organizations. As Jesus cried out in thirst from the Cross, we too thirst for justice – for the environment and for all creatures adversely affected by systems that misuse or destroy Earth, our sacred home. The Ecumenical Walk for Justice began in 1979 and has focused on a range of issues including peace, indigenous relations, the criminal justice system, violence against women, the environment and economic injustice. It is organized by a planning team drawn from several Christian denominations. Some 300-400 people take part each year.